Pia Silvani has been teaching for over 30 years starting with dance, track, and swimming. But she found her true calling in coaching people and teaching dogs where she continues to receive international recognition and accolades in the many programs she has developed. Pia has developed numerous courses focused on positive, reward-based techniques, which are extremely effective in the enhancement of the bond and relationship of the dog with his/her human companion. The result was an astounding 100+ classes per week. 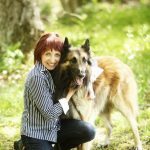 The very successful Feisty FidosTM curriculum, which she developed while working at St. Hubert’s Animal Welfare Association, Madison, NJ, has gotten rave reviews around the world. was instrumental in developing a behavior department. developed a canine coach program where volunteers and apprentice dog trainers work with shelter dogs to help them become more adoptable by achieving and maintaining good manners. Pia has spoken at various conferences and forums nationally (in 47 states) and internationally (including Belgium, Bermuda, England, Canada, Japan, New Zealand, Australia, Mexico and Chile). She makes guest appearances on television and radio and consults with various shelters to assist them in improving and expanding their programs. Pia has recently moved to Asheville, NC, where she will the ASPCA’s Behavioral Rehabilitation Center’s new Director of Behavior Rehabilitation focusing on fearful dogs.